Mix all ingredients together and marinate the chicken fillet. I marinate them immediately in a container that fits and can be used in the airfryer. Leave the chicken in the marinade for at least 2 hours in the refrigerator, preferably longer (an entire day is even better). Preheat the airfryer to 180 degrees. Put the marinated chicken with the marinade in the box in the airfryer, splash lid does not have to be because the chicken is in a bowl ..
Set the timer to 7 minutes, turn the fillets over and do it again for 7 minutes. 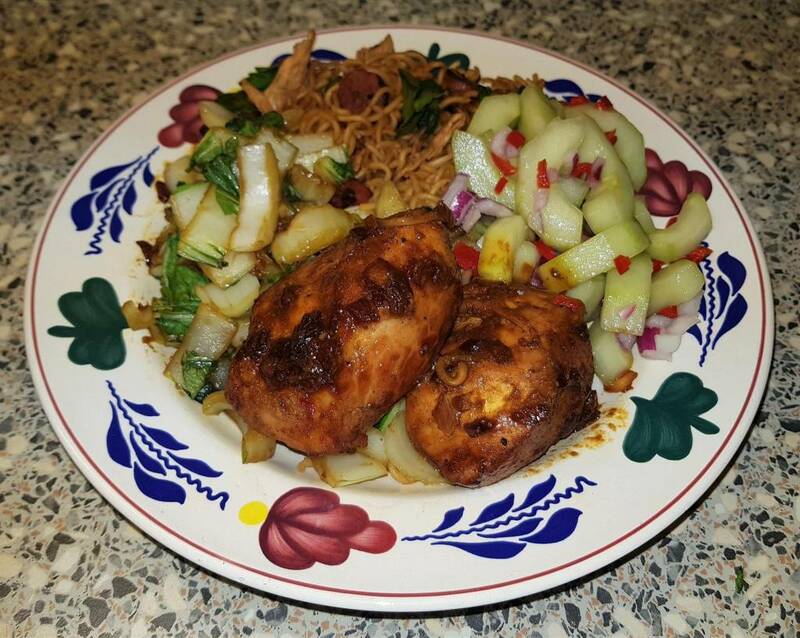 Delicious with the Surinamese noodles, the stir-fried pak choi and the sweet-sour red onion with cucumber. If you eat all that together, it costs you 13 points.